Integrated landscape initiatives in Latin America, the Caribbean and Africa are investing heavily in institutional planning and coordination, but they have had mixed results engaging different stakeholder groups, especially the private sector. This key stakeholder group was almost always missing from a selection of landscape initiatives surveyed recently. “Incomplete” or “shallow” stakeholder engagement was the most frequently reported challenge by the nearly two hundred landscape initiatives from 54 countries (33 African and 21 from LAC region) that participated in the study. African initiatives were the most affected. According the respondents, private-sector stakeholder groups representing agribusinesses and extractive industries (e.g. timber, oil and gas) rarely participated in their initiatives; they were involved in less than 10% of the initiatives in Africa and around 22% in the Latin America and Caribbean region. On the other hand, local farmer groups or producer associations were the most active stakeholder group in the landscape initiatives, participating in over 80% of the surveyed initiatives. Local government entities, extension agents, and local non-governmental organizations (NGOs) were equally active, and were involved in more than 70% of the initiatives. The chapter with these findings is part of a new World Agroforestry Centre (ICRAF) publication, Climate-Smart Landscapes: Multifunctionality in Practice. The volume brings together, for the first time, original research and syntheses on landscape approaches to climate change mitigation and adaptation. Collaborators in the survey’s design were EcoAgriculture Partners, World Agroforestry Centre (ICRAF), Rainforest Alliance, Bioversity International, Conservation International, Cornell University, and the Landscapes for People Food and Nature Initiative. The current paper presents an analysis from 191 initiatives; 104 in the Latin America and the Caribbean (LAC) region and 87 in Africa. Hart says multifunctional, climate-smart landscapes are able to produce many different and sustained benefits for people and the environment in the face of climate-change, but stakeholder participation is essential. “Clarifying the benefits of integrated landscape management to different stakeholder groups would be one way to increase stakeholder participation,” she states. “Policy frameworks with incentives for such stakeholders to participate” will also be critical for the success of landscape initiatives. For private-sector stakeholders, incentives may include reduced risks to business and benefits for business’ reputation. 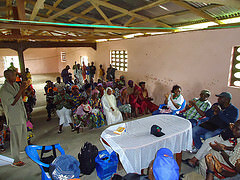 Stakeholder engagement in integrated landscape approaches would also be boosted if researchers were able to demonstrate, with evidence, that the benefits of integrated approaches outweigh their transaction costs, and that the magnitude of benefits to diverse stakeholders is greater than single-sector strategies for development and conservation. As such, despite the challenge inherent in the approach, landscape initiatives are set to grow in importance. The researchers hope that the findings of this study will help to inform and improve the environment in which landscapes initiatives, particularly those in the developing world, operate. They will, no doubt, because besides stakeholder analysis, the article is rich in data and insights gained from a systematic characterization of the context, motivations, investments, outcomes and participants of the 191 initiatives using landscape approaches in Africa and Latin America.